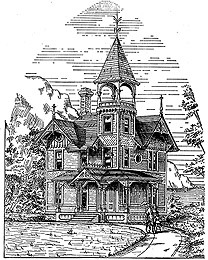 Cottage house plans for a small Victorian style house. These house plans feature a house of 26 x 26 feet. It will be noticed that one chimney serves for communication with every room in the house, thereby securing the greatest economy in heat as well as in construction. Elegant pocket doors divide the living and dining room, and long windows from the parlor and hall open upon the front porch. In the second story are four bedrooms and a bathroom. 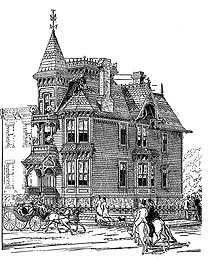 Victorian townhouse plans for a city residence are the wonder and admiration of the neighborhood, standing out in beautiful relief from the stereotyped flat roofs and facades of the townhouses in the vicinity. The parlor and dining room each contain a fine semi-octagonal bay window. The several fireplaces of the first floor are placed in the best positions for utility and effect. The sliding doors dividing the parlor and dining room are finished with elliptical head, and trussed arches of the same form span the bay windows. Presented are Victorian cottage house plans for a French Gothic style country house. The kitchen is supplied with all conveniences; back stairs to the second floor, and communication direct to basement; sink, table with cupboards below, and closet for kitchen cooking utensils. This Victorian country home design was erected at different periods of the 19th century. The main building was constructed in 1868 and then expanded upon in 1870 with several additions, consisting of a laundry, and a new dining room with dinner service rooms and pantries. 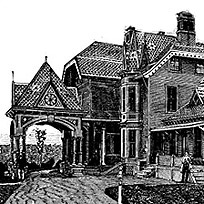 This Victorian house plan is taken from Leffel's House Plans and show front and side elevations and floor plans of a very attractive cottage. Particular attention is called to the entrance hall in this Victorian house plan design which provides convenient access with parlor, kitchen, bedroom and chambers. 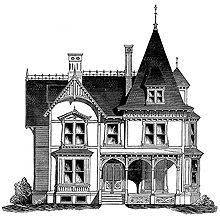 These French house plans from 1878 were designed for a cottage with a Mansard or French roof. The sketches also outline the grounds immediately surrounding. The porch is in an angle, and the second story extending over it is carried up vertically past the slated part of the main roof, forming a tower-like corner. 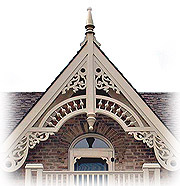 Gothom Inc., a manufacturer of custom Architectural Ornament is profiled. There is perilously little that Joe Colucci cannot make. 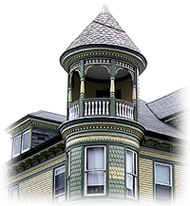 If you have a Victorian house plan project, particularly if it is artistic or challenging, he will consider it. You truly feel transported to another time in history when you walk into this breathtaking 3,632 square feet home. Located in charming Millersburg, this magnificent home was built in 1860, for Doctor Ulrich, a family physician and surgeon, who kept his office in the parlor. Does your Victorian house plan match this Victorian home? 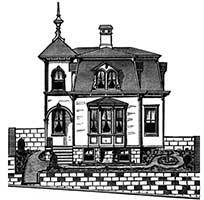 Have a favorite set of Victorian house plans? 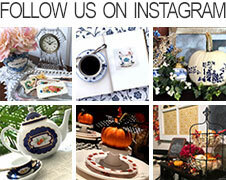 Need Help with restoration or inspiration for a restoration project? Use Google Maps Street View for inspiration for your next home improvement project or to dream with your Victorian house plan. For the past ten years this magnificent house has been lovingly and meticulously restored by Bill Hammond Norton, the great-grandson of one of the early owners, Fannie Lee Hammond. Sits on an entire city block and the grounds include a historic gazebo and historic carriage house. Backs up to a beautiful historic cemetery. 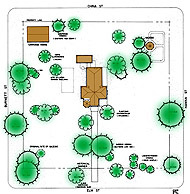 See the Hammond House- with House Plans.